In Part II, we look at Jenny Hughes, who recently rebranded her company after a four-year trademark lawsuit. She's been in business for five years and designs reusable cloth shopping bags. Her marketing has included getting her bags onto the 'swag' table at Toronto's International Film Festival, resulting in celebrities like Julianne Moore and Matt Damon using her bags. 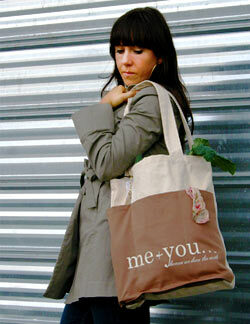 Jenny Hughes, owner of Me & You, was motivated to start her business because of a strong passion for the environment. When she started five years ago, the majority of reusable shopping bags were “really low quality” she remembers. She envisioned a company that would supply heavy-duty, reusable cloth bags designed to last a long time, manufactured by local sewers, with attractive designs and fun sayings. They started the business using their own cash and found ways to keep their start-up costs low. Her partner, who had a background in marketing, took care of promoting the business and Jenny, being a designer, was able to create the logo, all the branding and the website, as well as the designs and concepts for the bags. “That saved us a lot,” she says. They also initially ran the business from their homes so essentially, they just needed money for production. They had the idea, the passion and the skills to put it into action, but no business plan. They used to be called B.Y.O.B. : Bring Your Own Bags, but they didn't trademark their name and six months into the business, someone applied for the trademark. Having to fight the lawsuit took a lot of energy as well, and there were times when they thought they might just quit. They used to have a studio space for a couple of years, but when the lease came up, they still didn't know what was going to happen with the trademark and Jenny wasn't sure she wanted to rebrand at that point, so they gave up the studio and went back to working from home. Then about six months ago, two things happened: the lawsuit was settled – they gave him the trademark and in exchange, he bought them out – and someone Jenny used to know came back into her life and offered to help her with the rebranding. As a result, she bought out her original business partner and took on the new partner, and they rebranded as Me&You. Christmas is her busiest season. A lot of companies want their logos and branding on the bags, which they then give out at their Christmas parties and give away to their clients. 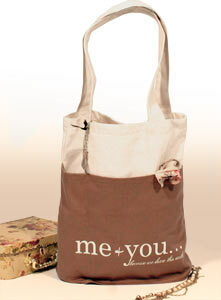 Me&You also gets a lot of online sales at Christmas from people looking for quality, useful gifts. However, even during the slower season Jenny estimates she works around 50 hours a week. Part of what keeps her busy is her marketing plan. They do a lot of online marketing and Search Engine Optimization (SEO). They do a small amount of advertising in print material, and they attend a lot of markets and tradeshows. She says running you own business is both exciting and demanding. There are times when she thinks how nice it is to work for someone else: to have a regular work week, paycheque and benefits. 1. Always trademark your name. 2. Surround yourself with supportive business owners. If you know anyone who's starting a business, meet with them, talk with them, find out tips. Ask them questions. 3. Get a mentor. For $100 a year you can get a mentor through Forum for Women Entrepreneurs (FWE). “We had that for about two years and it was amazing,” she says. 4. You may need to supplement your income in the beginning. Jenny did freelance design on the side, for example. I have owned one of Jenny’s bags from almost the get-go. 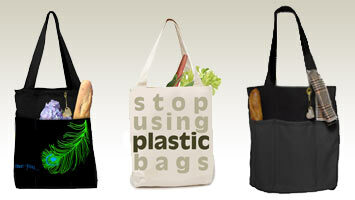 It is still my primary shopping bag…sturdy and very comfortable to carry even with heavy loads. Jenny’s story is full of business lessons for early stage business. I hope lots of women read this article, go back to the business plan and then review their risks. Thanks for sharing the lessons!